When it was announced in 2008 that Suspiria, Dario Argento’s legendary blacklight poster of a horror film, would be receiving a remake, the horror world let out a collective defeated sigh. This was at the nadir of a particularly fallow period for the genre, in which seemingly every horror film with an iota of name recognition was given a slick reboot for the post-Saw era. Suspiria didn’t need a remake, but neither did Texas Chainsaw Massacre or A Nightmare on Elm Street or I Spit on Your Grave (the latter somehow spawning a trilogy of remakes!). This was the way of things; the best that could be hoped for was that the Suspiria remake would be released and forgotten, and we could all go back to blasting that badass Goblin soundtrack. Eventually, the reboot wave ebbed, and it seemed safe to say that the Suspiria remake died an unmourned death in development hell. Then, in 2015, a strange thing happened: the Suspiria remake was back on, with Luca Guadagnino attached to direct. This was notable; while Guadagnino had yet to break through to the mainstream with Call Me by Your Name, his I Am Love and A Bigger Splash indicated that this may not be just another work-for-hire reanimation. The project gained further attention when it was announced that the leading lady of those films, Tilda Swinton, would also be on board, which, if not a guarantee of a good movie, would seem to promise at least one compelling performance (see: Constantine). Shortly after, Radiohead frontman Thom Yorke signed on to contribute his first-ever original score. And in the time since the project’s announcement, horror itself lurched into an unlikely boom period, with films like Get Out, It Follows, Hereditary, and The Witch forcing critics to pay serious attention to the oft-maligned genre. Slowly but surely, the Suspiria remake was looking less like a mechanically-generated cash-in and more like an actual cultural event. Now it’s here– but is it any good? The bare bones of the story will be familiar to fans of the original: an American ballerina named Susie Bannion (Dakota Johnson) makes her way to the prestigious Markos Dance Academy, run by the enigmatic Madame Blanc (Swinton). She arrives shortly after the departure of Patricia Hingle (Chloe Grace Moretz), who rushes to psychiatrist Josef Klemperer (Swinton again, under impressive prosthetics and an elaborate misinformation campaign), babbling about witches, before seemingly vanishing off the face of the earth. Despite her lack of formal training, Susie quickly shoots to the top of her class, gaining the attention of Madame Blanc and her equally forbidding fellow teachers, but is there something sinister going on behind the scenes? (The answer, of course, is yes). Much of the initial skepticism around the Suspiria remake was rooted in the fact that the original primarily succeeds as spectacle; the story itself hardly even tries to make sense, and largely takes a back seat to Argento’s eye-popping visuals and Goblin’s pummeling score. The most fascinating thing about the new version is that Guadagnino takes that story and uses it to create an entirely different spectacle. Gone are the original’s fluorescent reds and blues, replaced with natural lighting and the earthy tones of postwar Germany. In contrast to the disorienting Italo-prog of Goblin, Yorke’s score is quiet and ethereal (oddly, one recurring, elliptical piano motif seems to owe more to Fabio Frizzi’s work in Lucio Fulci’s The Beyond than any of the Argento-Goblin collaborations). While a handful of memorable sequences are recreated, the original’s iconic opening scene is conspicuously absent, as are many of its most arresting setpieces. And without spoiling anything, suffice to say that the film’s finale diverges significantly from its source material. Instead, Guadagnino appears to have searched for aspects of Argento’s original script that remain relatively unexplored in the original. While the original treats the dance academy largely as a backdrop, for example, Guadagnino puts it front and center, stopping for several arrestingly staged routines and using dance as a framework for the coven’s ideology (“Two things which dance must never be again are ‘beautiful’ and ‘safe,’” Blanc tells Susie at one point, “We must break the nose of every beautiful thing.”). Guadagnino also greatly expands upon Argento’s “Three Mothers” mythos, a loose story thread that begins with Suspiria and runs through 1980’s Inferno and 2007’s The Mother of Tears. And while Argento places the academy in a sort of fairytale limbo, Guadagnino takes full advantage of its time and place in 1977 Berlin, playing the story against the backdrop of a Baader-Meinhof hostage situation. The political aspect is further brought to the forefront by Dr. Klemperer (the only major character created specifically for the remake), a holocaust survivor who has spent the past forty years searching for his missing wife (played in flashback by original Suspiria star Jessica Harper). In case the above description hasn’t made it clear, there is a lot going on in this film, enough that I almost feel like I need to digest it longer before rendering a verdict. At over two and a half hours, it is not only a full hour longer than the original, it also outweighs such film epics as Apocalypse Now, The Tree of Life, and Goodfellas. As such, it’s difficult to fully parse the film as a whole in one pass. 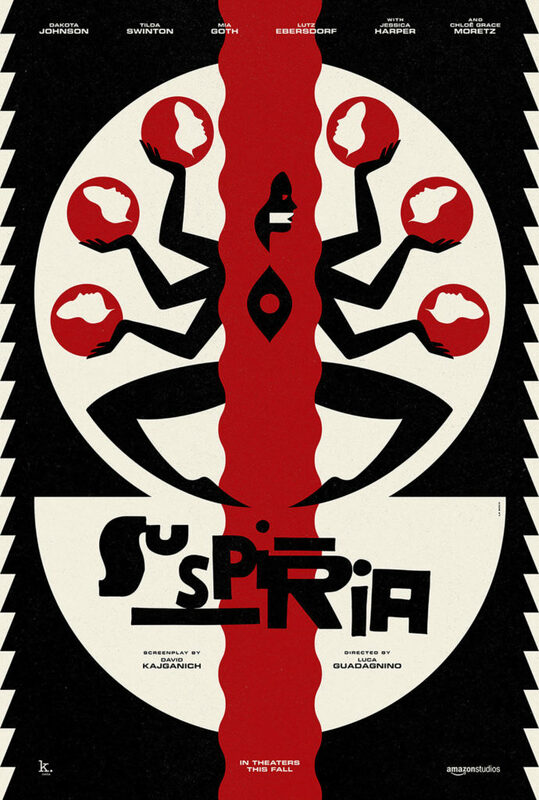 In addition to its story and its relationship with the original, Suspiria clearly has a lot on its mind about religion, feminism (it is worth noting that the film’s only named male character is played by a woman), compassion, the cyclical nature of extremist politics, and the meaning of art on both a personal and political stage. So rather than settle on one unified opinion of the film, I’m going to start by detailing the things that absolutely work, then move on to some of the things I’m less sure about. I don’t know if I’ll make up my mind by the end of the review, but with any luck you’ll have decided whether it’s something you want to see. For starters, this is a legitimately gorgeous film. Unlike Argento, who made artifice into an artform, Guadagnino opts for a naturalism that borders on the pastoral; you can almost feel the chilly air of winter in Berlin wafting through the open windows, and every room is furnished with the fascinating designs of mid-century eastern Europe. The costumes, editing, and cinematography are striking, particularly in the dance sequences. And Tilda Swinton turns in one of the most audacious performances in a career legendary for its audacity (in addition to the roles mentioned above, Swinton also plays the matronly Helena Markos, an ancient witch who appears to have survived being burned at the stake). As Madame Blanc, Swinton brings the commanding yet ethereal presence that is her trademark; in each of her scenes, Blanc is cerebral, wry, nurturing, and terrifying, frequently at precisely the same moment. The real revelation, though, is her work as Professor Klemperer. Despite being buried under mounds of Trash Humpers-esque makeup, Swinton turns in a nuanced, tremendously affecting performance. 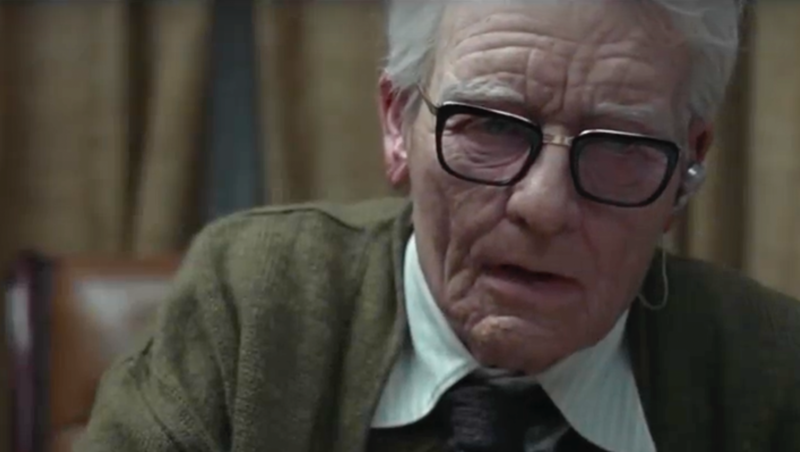 Throughout the film, Swinton carries Klemperer with visible weariness, and in his unguarded moments of reflection on his wife, the heartbreak Swinton brings to the role is palpable. But does that raw emotional devastation belong in the same movie as Satanic blood-orgies and graphic psychic dance-murder? That’s not a rhetorical question, but one that I will be pondering in the weeks and months to come. Guadagnino’s Suspiria is nothing if not ambitious, but when a film tackles such a broad swath of heavy topics, it becomes difficult to treat each one with the weight it deserves. Similarly, the expansive cast can become difficult to keep track of, especially when they have three different Tilda Swintons to compete with (there is a peculiar, bird-like woman on the academy’s faculty, for example, who clearly signifies something, but I’ll be damned if I could tell you what). Then there’s the matter of the ending, which not only deviates dramatically from the original, but fundamentally alters the entire story in a way I’m not entirely sure tracks. So did I like it? That’s something I’m still not sure I can say. I will be very interested to see where public opinion falls on it five years from now; the common criticisms against it (including my own) echo initial responses to Herzog’s Nosferatu, Coppola’s Dracula, and The Shining, all of which were blasted at the time of their releases for being pretentious and inscrutable, only to be reappraised later. I do believe, though, that the discussion will continue, which is more than one can say for most horror remakes from the past fifteen years. Horror reboots continue to be inevitable, and I appreciate when their makers bring something personal to the table, even if the end result is flawed (I feel similarly about Rob Zombie’s Halloween, which is deeply misconceived, but which is undoubtedly the most interesting Halloween remake we could have gotten in 2007). Luca Guadagnino’s Suspiria may not be the masterpiece it’s trying to be, but it is trying; to create something so deeply weird, on so grand a scale, is undoubtedly an accomplishment in and of itself. That it’s not the greatest accomplishment in horror this year is somewhat disappointing, but it also says a lot about the state of the genre.